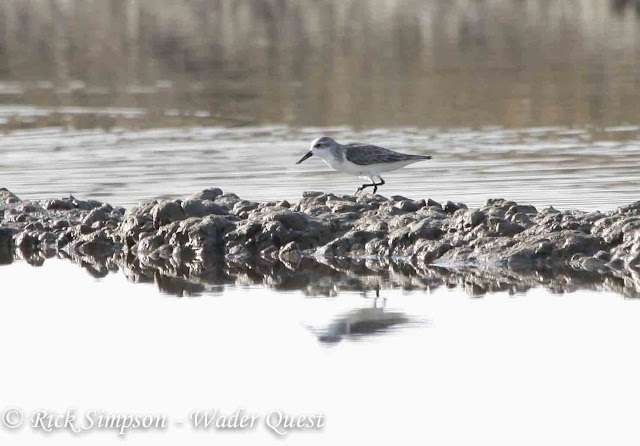 Wader Quest: If you could be a wader which one would you be? If you could be a wader which one would you be? We often ask ourselves what we would do differently if we had our time again, or which species of bird we would like to be if reincarnation proves to be a reality? So I wondered what wader species I would like to be if I were able to go back through evolution? 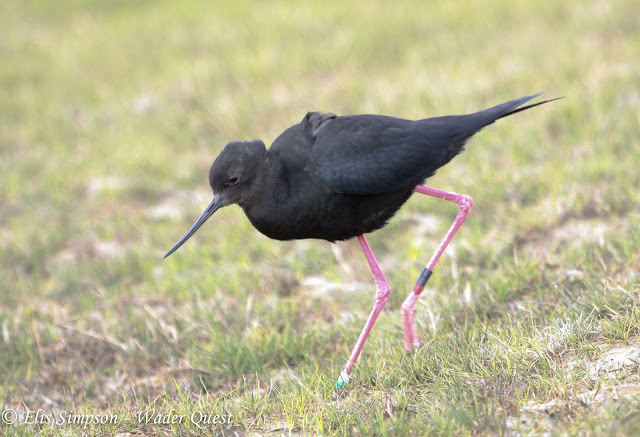 There are some wader species that I certainly would not choose to be and those are the endemic, island-dwelling, ground-nesting waders in Oceania which includes Australia and New Zealand. Of the four species of Prosbonia only one still exists,Tuamotu Sandpiper. The Christmas, Moorea and Tahiti (White-winged) Sandpipers have all gone, the latter only known from a single specimen of a wing. In New Zealand both the North and South Island Snipe have gone whilst, interestingly, those snipes that still exist do so on remote islands; Chatham Island, Snares and Subantarctic Snipe. Any species that lives solely on one island or group of Islands is always going to be vulnerable, the Critically Endangered and probably extinct Javan Lapwing and Canary Island Oystercatcher being two prime examples. The six extinct species of wader and the four that are Critically Endangered but probably extinct (Javan Lapwing, Eskimo and Slender-billed Curlew and Jerdon's Courser) are certainly non-starters and so are the other Critically Endangered birds, even the Spoon-billed Sandpiper because although everyone adores them, they are not in any way safe from harm or extinction. Spoon-billed Sandpiper. Pak Thale, Phetchaburi, Thailand. I wouldn't want to be a Black Stilt either, elegant and beautiful as they are, even with the captive breeding and release of so many each year, once they have dispersed the chances of meeting another Black Stilt again are small and you are condemned to a life of celebacy unless you swallow your pride and mate with another species ie the White-headed Stilt. In terms of species survival though this is not the way forward. In addition it would be fairly foolhardy to be one of the species thought to be fair game by shooters - even now with tumbling populations everywhere, so the so-called 'game birds' such as snipes and woodcocks are out of the question. I think too it would be safe to assume that being a species that migrated through North America in any numbers in the late nineteenth century would not guarantee survival even if you were perhaps the most numerous wader species on earth. Indeed any species that was anywhere near anyone at all was in danger at that time of global discovery, collection and out and out slaughter. Black Stilt. Glentanner, Mount Cook, New Zealand. You'd have thought that living a remote life far from where humanity was comfortable would be a safe bet, would you not? So living at the tops of very high mountain ranges would give you the edge, and perhaps it does if your only threat is from people directly. 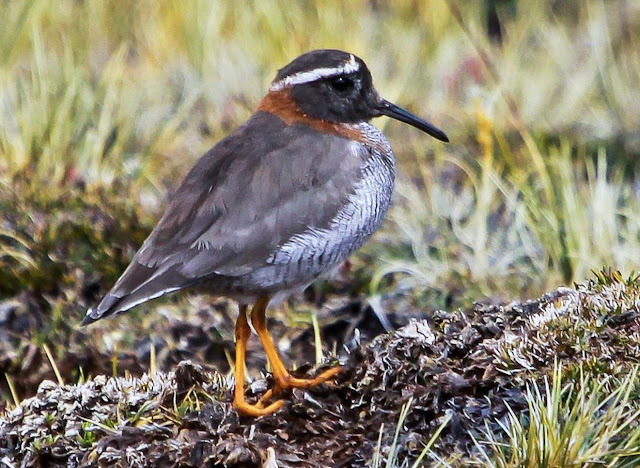 But, we know that bird populations are breeding further north and also that they are breeding at higher altitudes than previously due to the gradual warming of the planet, so what happens to those that live at the very tops of those mountains like the Diademed Sandpiper-Plover? Where do they go when the climate changes enough to affect their habitat and food supply? Being a long distance migrant is a good strategy as you get the best of both worlds or at least that is what it used to mean. It now also means that you get the worst of both worlds too. The world is currently divided up by humans into national states and each one has its own rules. If you as a species happen to live your entire life within one that is sympathetic to wildlife and conservation you can count yourself lucky, but long distance migrants are subject to an array of attitudes along their flight path. You may be protected one side of a line that is invisible to you, but face a barrage of persecution on the other side. That is why protecting flyways is so important and organisations such as the EAAFP and WHSRN are doing such a wonderful job. So enough of what I don't want to be, what do I want to be? 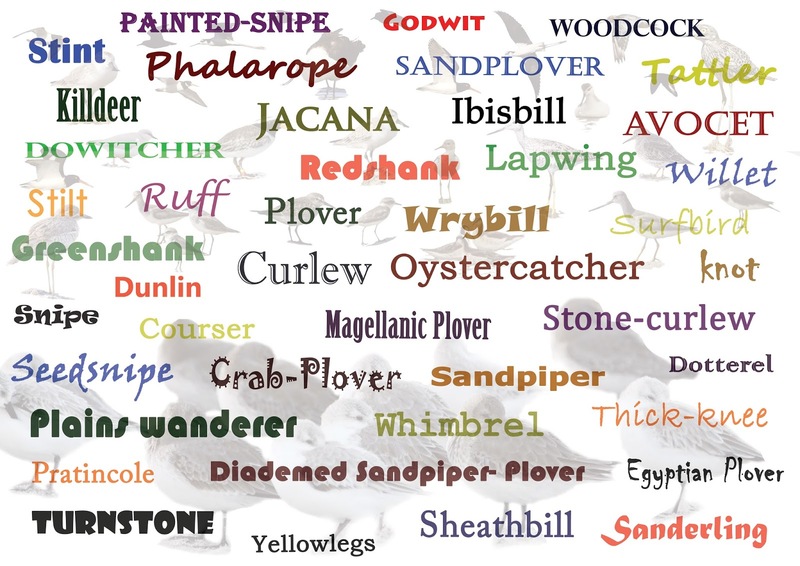 Lets eliminate the above; no long distance migrant, no human activity, not a game-bird, not an island endemic, not an altitudinal specialist, not a very rare bird and you certainly don't want to be reliant on mudflats, estuaries, beaches or wetlands in general. That doesn't leave much does it? The fact is almost every species of wader in whatever situation it finds itself is under attack one way or the other, very few have come through the Anthropocene (human dominated geological era) period thus far unscathed. So what species has got the best chance of survival? 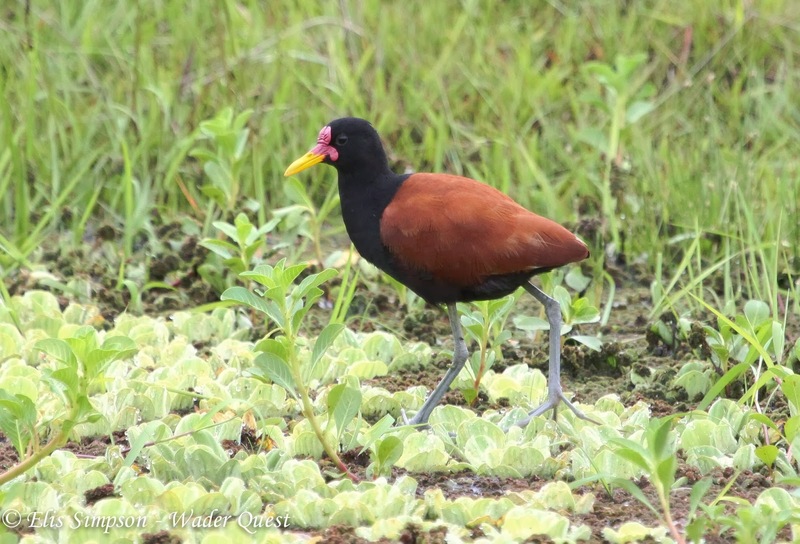 The jacanas are largely resident and live in warmer climes, so, their long term chances are brighter than those that depend on cooler temperatures. However they are wetland dependent and therefore cannot be assured an indefinite future. Wattled Jacana. Tavares, Rio Grande do Sul, Brazil. At the other end of the wader spectrum Snowy Sheathbill is resident where few humans dwell and generally it is not sought as food, but it is dependent on the Antarctic and although this doesn't seem to be getting warmer as quickly as the north, it is still too much on the edge for my liking. 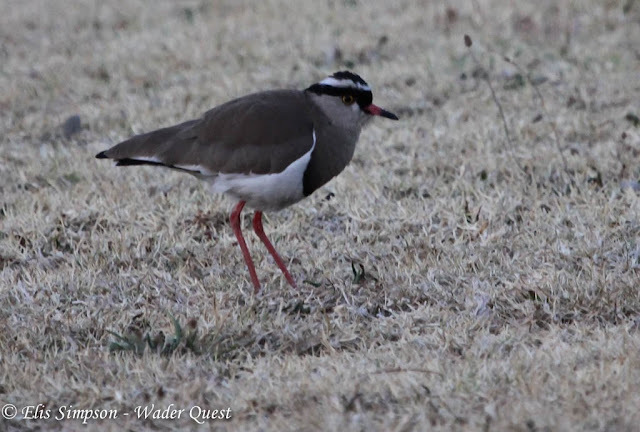 Maybe if you are a courser or a sedentary lapwing things are looking better, especially those that live in Africa that are not so wetland dependent for example. OK the equator may be getting hotter and the desertification widening, but in the long term you only have to shift a small distance to keep pace with the change. Maybe a Cream-coloured Courser a bird with a large range and which is desert tolerant would be tempting or Crowned Lapwing which too has a large range and is not strictly wetland dependent being much more tolerant of drier environments. Crowned Lapwing. Johannesburg, Gauteng, South Africa. Given a choice between these two in terms of survival chances the Cream-coloured Courser probably has a greater future, but actually it is to South America that I look for my most resilient and likely-to-succeed species and that is Southern Lapwing. Not only is it common and like the Crowned Lapwing has a large range and tolerant of drier habitats, it is more or less habituated to humans who, in general terms tend to leave it in peace. And so, as a declared Lapwingophile, I will go with my heart and re-incarnate as a Southern Lapwing; and that way I'll get to live in South America again too! Southern Lapwing. Ubatuba, São Paulo, Brazil.